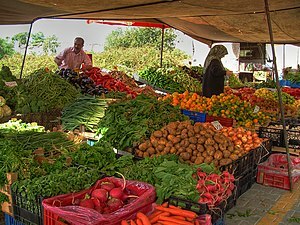 Somehow, buying fresh fruit and vegetables at local market has always excited me. Maybe it’s a childhood habit. I often accompanied my mother during school holidays to buy seasonal fruit. Bright yellow bananas and lemons, red ripe tomato and plump orange hued mango were neatly stacked on wooden carts. Tugging at her saree, I would demand as much attention as the vendor screaming cheaper prices. It would soon end as we both lifted fancy cloth bags filled with fresh produce and walked home. THAT is how this blog got it’s name! It’s non stop action in the market – vendors arranging or sorting fresh produce, setting up the stalls and poles, sipping his cup of tea between selling vegetables or counting his day’s earning. Markets are also about people – you meet family or friends, exchange customary greetings. Be it a French kiss or Indian Namaste, local culture, clothing and traditions can be easily spotted. Markets are also about weather and seasons. Juicy mangoes during Indian summer, avocado in temperate climates, fresh salad vegetables are summer delights and come winter rhubarb, spinach and apples fill stalls. Markets teach us about local food and etiquette. Some local vendors might just share their ‘Mama’s‘ recipe with you, if you are lucky. You will find chopstick stalls in Korea and Singapore, stainless steel utensils to cook Indian food and exquisite carved Rimu wood salad bowls in New Zealand. Who ever thought that two markets are the same ? Now, let me share my personal experiences with you and take you around the world! Closest I have is Pike Place Market in Seattle. It is pretty amazing for a completely urban, fresh market! Great photos!